We are excited to announce that Student One has signed on as our very first Major Partner! Our first activity with Student One is an exciting new event…post Burpees for BYS, get ready for a sprint! On Thursday 6th June 2019, Student One in association with Activ8 Change will host Australia’s first ever night-time vertical sprint, the Brisbane Vertical Night Sprint, to raise awareness and vital funding for Brisbane Youth Service. 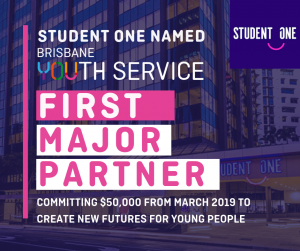 In its inaugural year, Student One expect that between 300 and 500 participants will challenge themselves and the clock, racing up 40-storeys at one of the world’s tallest student accommodation towers, Student One Wharf Street, attempting to ‘break the stair barrier’ in aid of Brisbane Youth Service. We are very excited to be beneficiaries of this exciting event and look forward to working with Student One over the next 12-months to create new futures for young people!